George Downing was born on 25 December 1762 in London, the son of Reverend George Downing, Rector of Ovington, Essex. He attended Doctor Parr's School at Stanmore, Middlesex and after finishing his education, he was articled to Mr. Alston, a solicitor at Nayland, Essex. He was called to the Bar at Lincoln's Inn, London in 1794. He became a Senior Lieutenant in the London Light Horse Volunteers. As a pastime he wrote Greek verse, some of which were published anonymously. I delivered to Mrs Hart of Boxford a mortgage bearing date the 29th day of May 1781 and made between Mrs Hart of the 1st part Sam Ware & E Gray of the 2nd part and Jne Hart decd of the 3rd part also bond bearing date 31 May 1781 from Mrs Ware to Mr Hart deceased also Indre of lease and release bearing date 11th and 12th instant the release being made between E Gray of the 1st part and Mrs Hart of the 2nd part an M Ware of the 3rd and E Taylor of the 4th also lease for year bearing date 11th inst from Miss Taylor to Mrs Hart and a bond from Mrs Hart to Miss Taylor for payment of 200 to Mrs Harts two daughters pursuant to Mr Wares Will. From an entry in the Diary of the Alston Law practice Nayland, document in Pictures file. George Downing of Lincoln's Inn was a barrister, called to the Bar 10 Oct 1794. Portrait and memoir in European Magazine Vol 39 pg 83 Feb 1801 Portrait in Gents Magazine and Freemasons Pocket Book. Provincial Grand Master for Essex (Freemasons). Senior Lieutenant Light Horse Volunteers. There is a monument to him in St. Paul's, Covent Garden. He was initiated (as a Mason) in Somerset House Lodge, No. 2, London (now Royal Somerset House and Inverness Lodge, No. 4), in 1793. In 1799 he was appointed a Grand Steward and served as President of the Board of Grand Stewards. The same year he joined Grand Stewards' Lodge, [SN. 162]. In 1796 he was appointed Provincial Grand Master of Essex, serving in this role until his death. In Royal Arch he was exalted in Chapter of St. James, No. 2, London and served as First Principal from 1796 to 1800. He was a Founder and First Principal of Hermes Chapter, No. 115 (of the Grand and Royal Chapter), Grays, Essex. However, this chapter did not survive and its Charter was returned. He died on 9 October 1800. In June 1793, . . . . . George Downing was invested at The Black Boy. Here at 9:00 am. 100 brethren assembled, where a public breakfast was provided. At 10.00 am. the Lodge was opened in the presence of 160 brethren (the lodges of Essex having petitioned H.H.H. 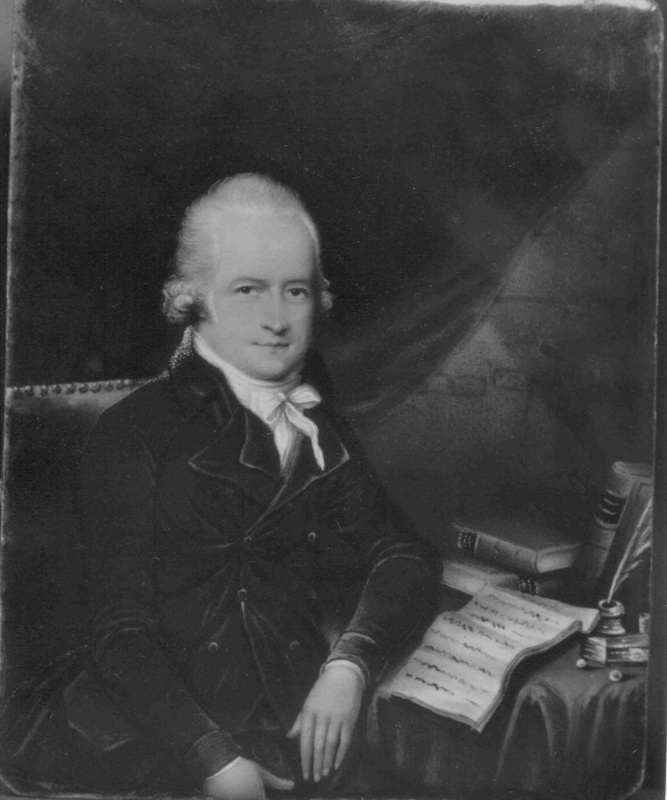 the Prince of Wales to appoint George Downing of Lincoln's Inn and Ovington) and afterwards 180 brethren proceeded to church and a collection of L12 was made; the day ended with a dinner in the Shire Hall. This day was publifhed, elegantly printed on a fine wove writing paper, hot preffed, embellifhed with a portrait of George Downing, Esq. Provincial Grand Mafter for the County of Effex, engraved by Ridley, from a miniature by Spicer, price 2s bound in red, or 2s 6d with a tuck, pockets, &c. complete. Copy of a letter, the original being in the position of Julia Redman 1999, postmarked 98 with a note by Alston Fenn "George Downing to George Alston refers to the birth of his daughter Catherine Mary Brackett (A9) also to their rumours of of George Alston's impending marriage to Mary Creek (A2)" also note by George Alston? "23 April Downing". on file 2007. Sir By desire of Mr Jones I called upon you yesterday to settle the two-year . . . . . Lady Day cash which he expects you to pay to me immediately. Mr . . . . . These appear to be drafts of letters emanating from George Alston's law office. Attested copy of Mortgage (Demise for 500 years), 29 Sept. 1783, to secure an annuity for life of L200 Sadler Whitmore of Wiston [Wissington] (co.Suff. ), gent. to John Hadley of West Bergholt, esq. Manor of Foxearth alias Foxyeard Hall and appurtenances; messuage called Foxearth Hall with lands, meadows, pastures, . . . . . in occupation of Richard Aldham Recites: D/DQ 84/39,40 Witnesses: Samuel Alston, Geo. Downing, jun. Opinions of Counsel (Lancelot Shadwell of Lincolns Inn and Geo. Downing) whether Sir Richard Neave may pay Mr [Tho.] Charles L415 in part discharge of his Judgment debt . . . . .
European Magazine February 1801 gives notice of George Downing's death 9 October 1800. Feb 1801 European Magazine gives an account of George Downing including an image. See pictures. A letter to George Alston by a friend and business associate in London Edward Blair dated 24 Nov 1800 refers to George Downing's death as "I was much shocked to hear by a brother soldier of his, the death of poor Mr Downing: that he died like a soldier thro excessive fatigue in the cause he had undertaken. Whether that cause be a good one or a bad one, is another question and will bear debate. I Have not yet called to pay my respects to your sister as I conceived that visits on such an occasion would be rather a troublesome intrusion, than a complement worth the accepting. I hope his time was not to much curtailed , to leave a suitable provision for his family. His business I am told was very considerable, but his expenses were also large. His private character and reputation highly respectable. His funeral according to the papers, a la militaire. It is thus the King rewards his martyrs, at a cheap rate to himself: with honours, and titles, and military trophys; or, in extraordinary cases, with pensions and preferments - which the country pays for. Through the duty in September just described the regiment sustained a severe lofs in the death of Lieutenant Downing, a very zealous officer whose services were most valuable in the field & in the committee. His constitution naturally delicate was not improved by the sedentary habits of a barrister rising to the first rank of the profession; the fatigue, together with exposure to the inclement weather during these nights of duty, produced a violent inflammatory cold which in have few days terminated fatally. It was so strongly felt throughout the regiment, that he is valuable life had been decidedly lost on service, that an urgent application was made to his family that his comrades might be allowed the melancholy satisfaction of honouring his remains with a military funeral. The family who naturally courted privacy in their affliction, having reluctantly acceded to the application, the regiment was afsembled in parade order on the 16th day of October & having received the body of their late comrade at his house in Hatton Garden, attended it to the place of internment, the vaults under St Paul's Covent Garden - The charger of the deceased, was led by the Honourable Spencer Percival, one of the earliest and most intimate friends of its late master. Three volleys were fire over the mouth of the fault by a division of the Dismounted, & the Regiment separated, with sincere regret for the lofs of a highly valued officer & an exemplary & accomplished member of Society. Oval aquatint miniature by Spicer in possession of E L Fenn Auckland NZ 1998. It was published February 1801 in The European Magazine, whose editor James Asperne was an ardent Freemason. Reproductions of the image of Downing were offered, Asperne described him as "a Man who was fo UNIVERSALLY BELOVED". The following is an ode to George written by an Alston (possibly by George or Samuel his Brothers in Law)?. And deck with fadeless flowers thy sacred shrine. 1. George Downing: Letter to his sister F E Downing, 20 Jun 1781, Ovington. 2. George Downing: Letter to his sister F E Downing, 6 Jun 1785, Nayland SFK. 3. George Downing: Letter to his Mother Catherine Downing, 31 Jan 1786, New Inn. 4. George Downing: Letter to his sister F E Downing C/o Mr Bowles Fort Bristol, 20 Aug 1790, Lincolns Inn LND. 5. George Downing: Letter to his monther Catherine Downing, 15 Mar 1794, Lincolns Inn LND. 6. George Downing: Letter to his sister F E Downing C/o Rev Downing Ovington, 30 May 1794, Lincolns Inn LND. 7. George Downing: Letter to his uncle Mr Bowles, 30 Jan 1796, Lincolns Inn LND. 8. George Downing: Letter to his sister F E Downing C/o Rev Mr Downing Ovington, Apr 1796. 9. George Downing: Letter to his sister F E Downing C/o Rev Downing Ovington, 3 Jun 1796, Lincolns Inn LND. 10. General Regulations of The Light Horse Volunteers, 1798. 11. George Downing: Letter to his Mother Catherine Downing, 8 Apr 1798, Re the birth & resuscitation of his daughter. 12. George Downing: Letter to his Mother Catherine Downing & father, 1 Sep 1798, Lincolns Inn LND. 13. George Downing: Letter to his Parents, 19 Sep 1798, Lincolns Inn LND. 14. George Downing: Letter to his father & mother, Dec 1798. 15. George Downing: Letter to his Parents, 1799. 16. George Downing: Letter to his Parents, 1799, Lincolns Inn LND. 17. George Downing: Letter to his Parents, Aug 1799. 18. George Downing: Letter to his Parents, 5 Nov 1799, Lincolns Inn LND. 19. George Downing: Letter to his Parents, 30 Dec 1799. 20. Letter to Col Herries by George's Executors: thanks for the support of the Corps of the Light Horse Volunteers, 17 Oct 1800, Hatton Garden London. Copy letter from th Executors of G. D. Snr to Col Herries"
In the names of the afflicted family of our much lamented friend Lieutenant Downing, and of ourselves as his Executors, we beg leave to return you, and trust you will have the goodnefs to communicate to the Corps at large, our sincere thanks for the very distinguish'd mark of Honour & Respect testified by their attendance on the melancholy occasion of yesterday. 21. European Magazine: Masonic Lodge Obituary & Reflection on life of Geo Downing, Feb 1801, London. BARRISTER AT LAW, LIEUTENANT OF THE LICHT HORSE VOLUNTEERS OF LONDON AND WESTMINSTER, AND PROVINCIAL GRAND MASTER OF THE ANCIENT AND HONOURAIILE SOCIETY OF FREE AND ACCEPTED MASONS FOR THE COUNTY OF ESSEX. THE virtues of private life, and the talents that adorn a retired station, are not less worthy of contemplation, and are more likely to be extenlively useful as examples, than even the policy of statesmen, or the exploits of heroes. The late much-lamented subject of this Memoir was the son of the Rev. George Downing, Rector of Ovington, Effex, and was born in London on Christmas Day 1762. After having received a liberal education at the school then kept by Dr Parr, at Stanmore, Mr Downing was articled to Mr Alston, a Solicitor of some eminence at Nayland, in Suffolk. At the expiration of his term he was entered of Lincoln's Inn, and in May 1794 was called to the Bar. Of his profession Mr Downing was a distinguished ornament. He soon perceived, that talents alone, however eminent, without great application, were inadequate to attain either distinction or emolument. Under this impression, he devoted his time almost wholly to study, very frequently consuming the "midnight oil" in short, no man, we believe, ever made himself more a slave (as it is sometimes called) to business than he did. The result was flattering and honourable to him; for, at the time of his death, though, in fact, a young man, he was nearly at the head of his profession in the conveyancing line. Translated from the Greek (see image opposite) by Dr S Lapidge1. "By playing sweet melodies on his lyre Orpheus led the foot [of the lady] that had died back to earth for a second time, because Apollo himself had taught him. And God taught you, O honey-sweet one, a stronger song, because you yourself raise those who are still living to Heaven." Almost the only kind of relaxation from the fatigues of business that Mr. Downing permitted himself to enjoy, he sought in the pleasurable and instructive pursuits of the ancient and honourable Craft of Free and Accepted Masons. The attention which he had paid to the acquisition of knowledge on this subject was soon evinced by the ability with which he illustrated the Lectures in the Grand Stewards and Somerset House Lodges; and which; very soon advanced him to the honourable distinction of Master of those respectable bodies, of which some of the first men in the country are members. The pleasure I derive from taking this chair receives a melancholy alloy from the consideration, that it is occasioned by the death of our late excellent Brother Dunckerley; a man who, for conviviality of disposition, correctness of principles, extent of Masonic knowledge, and readiness of communication, stood, perhaps, unrivalled; and who, by the happy application of there enviable endowments, not only conciliated the affection, but inspired the improvement of the Craft over whom he had the honour to preside. He loved Masonry from his soul: and as his attachment was not the effect of a hasty impression upon a lively imagination, but the result of a long and well-directed scrutiny into the nature and utility of the institution, he seldom failed to communicate a portion of his zeal to those with whom he conversed. I confess, Brethren, that when I contrast my own inexperience with his knowledge, and consider that I am going to build on foundations laid by so able an architect, I feel dispirited at what I have undertaken; and find nothing to console me but the reflection, that with the foundation he has left a design of the superstructure, and a number of well instructed Craftsmen to assist me in carrying it on. From my first initiation into the mysteries of our venerable order, they have been subjects of my continual admiration, and so much on account their antiquity as their moral tendency for though the former may attract enquiry and gratify the research the of the antiquarian, it is the latter which invites the cultivation, gives energy to the exertion, and insures final perseverance of the genuine Freemason. Let us not, however, affect to think lightly of the venerable sanction which our mysteries have acquired by the adoption of successive ages. Of their antiquity there is a sort of evidence which eclipses tradition. The method adopted by the Craft for communicating instruction to their disciples, was in use before the invention of letters. All the learning of the ancient world was conveyed in symbols, and intrenched in mysteries: and surely that is not only the most ancient, but the most impressive vehicle of knowledge, which by applying sensible objects to a figurative use, afford's amusement as well as instruction, and renders even the playfulness of the imagination, that most ungovernable of all the human faculties, instrumental to moral improvement. Those who have made enquiries into the rise and progress of science, have found that, in the early ages, all speculative knowledge was confined to a few, and by them carefully concealed from vulgar curiosity under the veil of mysteries, into which none were initiated, till not only their intellectual capacities, but the firmness of their characters, had been put to a severe test: the result of which determined the degree of probability that they would resist the stratagems of curiosity and the imperious demands of authority. The most famous mysteries on record are those in Perfia, which ,were celebrated in honour of the God Mythra, and those at Eleusis, in Greece in honour of the Goddess Ceres. Many arguments might be adduced to prove, that both there were corruptions, of Freemasionry; and hereafter I shall not want the inclination, if I do want the opportunity, to discuss them. At present, however, I shall content myself with pointing out the similarity which subsists between the initiatory rites practised by the professors of those mysteries and by our Brethren, both ancient and modern; more especially in the allegorical part of their ceremonials. I conceive it to the credit of the English Masons in general, that they are content to make a solemn impression without doing violence to the feelings of the candidate, to awe without intimidation; and we may be bold to affirm, that by how much soever the terror of an initiation into either of the Heathen mysteries above alluded to exceeded the terror of a Masonic examination, by so much, and more, do the moral and social advantages of the latter institution exceed those of the former. The former, springing from, and of course partaking of; the gross and dark superstition of the time; and countries where they were practised, had for their object the suppression of science, and the increase of superstition. The latter, boasting still higher antiquity, but fortunately originating in a part of the world where the unity of the Divine Being was not obscured by the mists of idolatry, had for its object the increase of knowledge, the worship of one God Eternal, and the admiration of his attributes, by the contemplation or his works. With the votaries of Ceres and Mythra the possession of knowledge was like lightning in the hand of a magician, dazzling indeed in its refulgence, but employed oftener to blast than to illumine: with our ancient Brethren it was like the fun in the midst of the planetary system, spreading forth her genial beams, and communicating light and action to the surrounding planets. For, if credit be due either to tradition or record, the western world is indebted for much of its present knowledge to the liberal communications of our Brethren. In the early ages, the weakness and prejudices of mankind rendered it necessary to conceal many truths, which the progress of civil society, and the consequent expansion of the human faculties, made it prudent to reveal. And though there still secrets which, for very weighty reasons we confine within the circle of the initiated, and sparingly communicate even to them, whatever appeared likely to increase the stock of human happiness, and deemed not dangerous in common hands, our ancient Brethren have generously communicated to the world. For proofs of the moral tendency of Freemasonry we need only appeal to our lectures, a due attention to which cannot fail of proving highly auxiliary to the practice of religious, and social duties. In them will be found a summary of moral conduct, which, in soundness of principle, and facility of application, may justly vie with the most celebrated systems of ethics: the whole rendered familiar to our conceptions, amusing to our fancies, and impressive on our memories, by easy and opposite symbols. By them we learn the analogy between physical and moral good, to judge of the wisdom of the Creator by the works of the creations and hence we infer, that our wise Master builder, who has planned and completed a habitation so suitable to our wants, so convenient to our enjoyments, during our temporary residence here, has exercised still more wisdom in contriving, more strength in supporting and more beauty in adorning, those internal mansions where he has promised to receive and reward all faithful Masons hereafter. Thus are our faith and Hope exercised by Masonic studies: but there is a virtue which divine authority has pronounced greater Van Faith and Hope, and to this excellent virtue of charity are our Masonic labours more especially directed. For this is the student reminded " to consider the whole race of mankind as one family, inhabitants of one planet, descended from one common pair of ancestors, and sent into the world for the mutual aid, support, and protection of each other;" and that, as the pale of our society encloses persons of every nation, rank, and opinion, no religious, national, or party prejudices should discover themselves at our meetings; but that, as our Brother Preston very feelingly expresses it, "both hearts and tongues should join in promoting each other's welfare, and rejoicing in each other's prosperity." In a word, that we should not only profess, but practice the three great principles of Brotherly Love, Relief, and Truth. There are some, I well know, who are so little acquainted with our principles and our practices, as to contend, that the whole of Freemasonry conflicts in conviviality. To these we are not afraid to declare, that in this respect we boast only this superiority, that our meetings are not infested with strife and debate: and where this the only distinguishing characteristic of the Brotherhood, the candle of Masonry might be pronounced to sink fast into the socket. But to the honour of modern Masons be it spoken, that an institution has been lately established among ourselves, which, though the latest is perhaps the brightest jewel in the Masonic diadem. You will easily perceive that I allude to our infant Charity in St George's Fields; an institution which resembles the universality of our order, by being confined to know parish, country, or climate; it is enough that the objects are the female issue of deceased or distressed Brethren. A charity, in its design more benevolent, in its selection more judicious, in event more successful, was never established. Mr Downing concluded with an elegant complement to the Patrons and Officers of the Institution; an appeal to the candour of the Lodge in case he should her in his future government of it; and an assurance of a constant and zealous attention to its interests and welfare. It only remains to observe that in his person Mr Downing was of middle stature; of a somewhat pallid complexion, the consequence, probably, of excessive study; his eyes, however, were remarkably vivacious, and his whole countenance was strongly indicative of intellectual endowments, and of a disposition warm, generous, and kind. His scholastic attainments were great and various; and his judgment was acute and comprehensive. There was scarcely a subject with which he was not in some degree acquainted, nor any branch of literature that he had entirely neglected. The writer of this brief outline is happy in saying, that he never met with companion more entertaining or instructive, or a friend more sincere. Ref: The European Magazine for February 1801. 1. I believe that there are some errors in the text of this epigram as it is printed in Mr Downing's obituary. I have attempted to correct these errors, and have printed above the text as I believe Mr Downing would have written it, although I have not bothered to include accent marks. S. Lapidge - 2017.